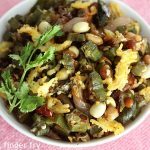 Ladies finger fry recipe or andhra bendakaya fry recipe – Learn how to make ladies finger fry with step by step photos. 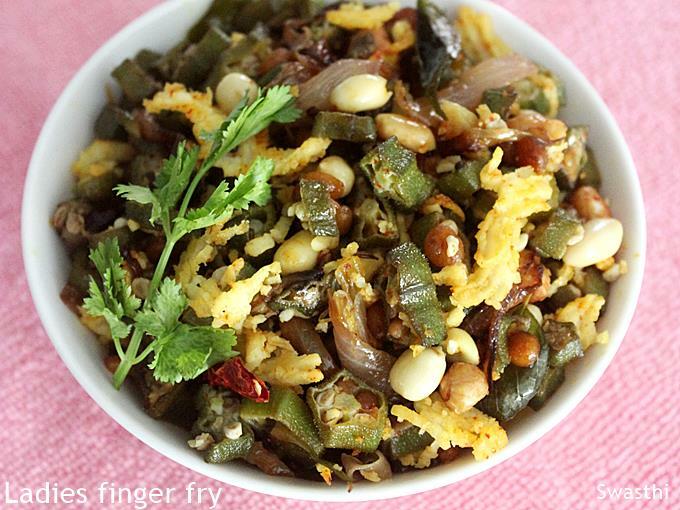 Ladies finger is known as bendakaya and vepudu in telugu translates to stir fry. Ladies finger or okra is one of the highly nutritious low calorie vegetable that is often used to prepare sambar, curry or stir fry in Indian Cuisine. 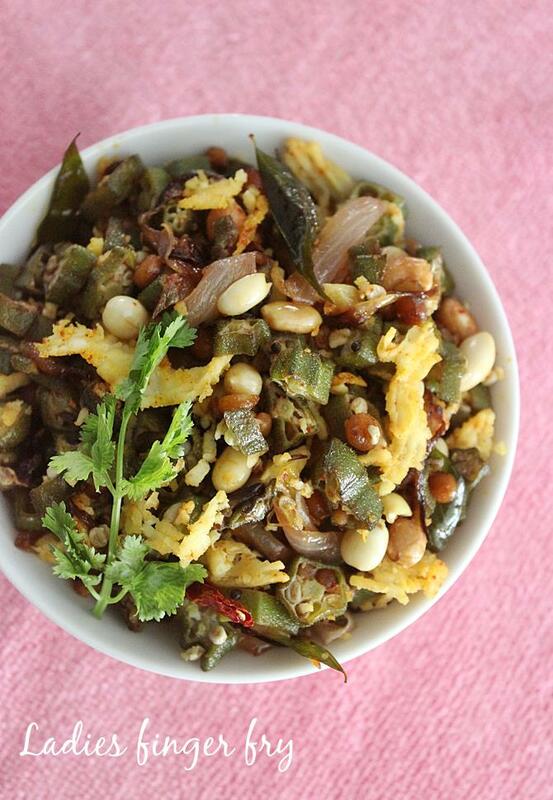 Today I am sharing ladies finger fry called as bendakaya palli vepudu in Telugu. 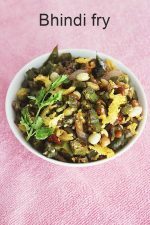 This is one of the best ways to serve bhindi to kids since this tastes delicious. For more kids friendly foods you can check these Recipes for kids. Slightly moist, non-sticky with an aroma of roasted coconut and peanuts makes this simple everyday vegetable a mouthwatering side dish. This easy ladies finger fry compliments any meal and can be had either with rice, chapathi or phulka. We usually serve this with sambar or tomato rasam along with rice. 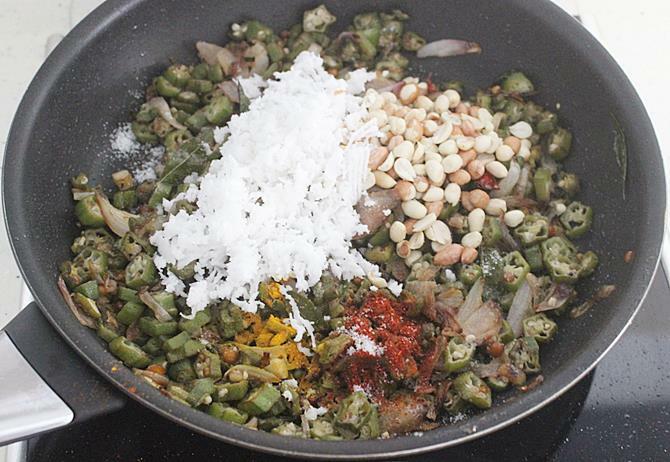 Ladies finger fry is simple andhra style stir fried okra dish made with basic ingredients. Pair ladies finger fry with plain rice and rasam or sambar. Ladies finger fry also goes well in school box. Wash ladies finger and dry them thoroughly. Wipe off with a clean cloth or absorbent papers. Chop the ladies finger to thin circles. 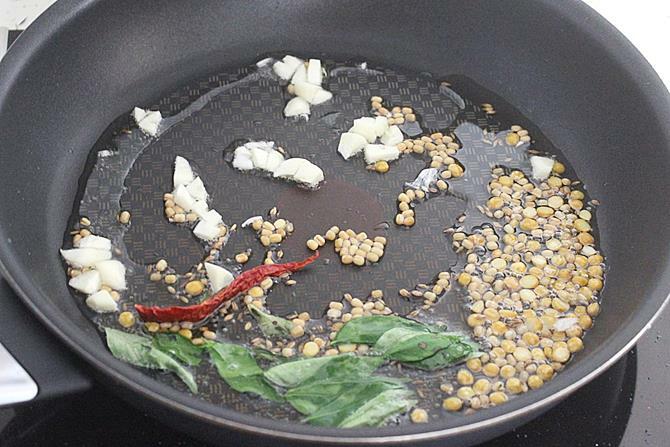 Add mustard, cumin, urad dal and chana dal. Fry them until the dals turn golden. Add garlic, curry leaves and chilies. 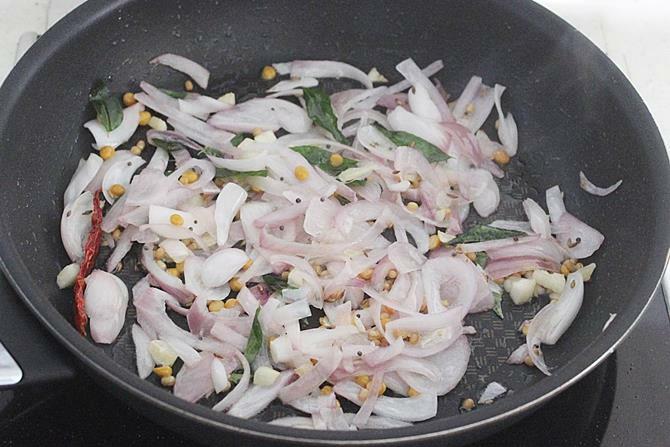 Fry till the curry leaves turn crisp. Add ladies finger and sprinkle lemon juice. Fry till the stickiness goes away. Lemon juice helps to get rid of the sticky substance from the veggie. Cover and cook till the ladies finger is cooked and turns soft. Add coconut, red chili powder, turmeric, coriander powder or garam masala. Add the peanuts as well. You can also coarsely crush them and add. Fry till it begins to smell good for about 2 to 3 minutes. Serve ladies finger fry with rice or phulka. 1. Rinse ladies finger under running water. Set them aside to dry. Then wipe off with a clean cloth or absorbent papers. 2. Chop the ladies finger to thin circles. Before you chop make sure they are not wet otherwise they will become sticky. 3. Heat a pan with oil. Next add mustard, cumin, chana dal and urad dal. Fry till the dals turn golden. Add garlic, curry leaves and chilies as well. Fry for a min. 4. Add onions and fry till golden. 5. Transfer chopped ladies finger and squeeze the lemon juice. 6. On a medium heat, fry till the sticky substance goes away from the ladies finger. It takes about for about 5 to 7 minutes. 7. Next cover and cook till the ladies finger is cooked and turns soft. 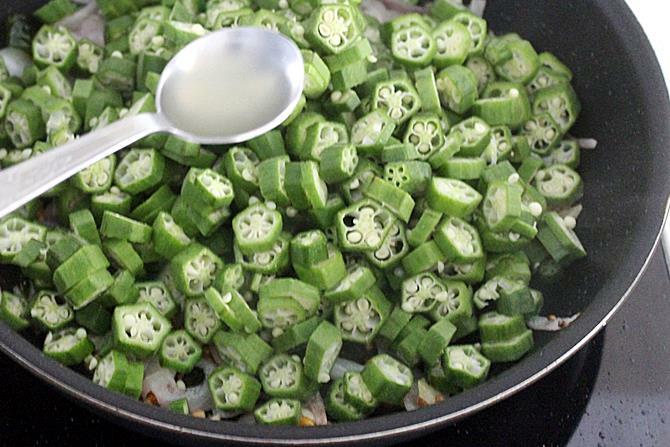 Cover only after bhindi is fried well till it loses its stickiness. 8. 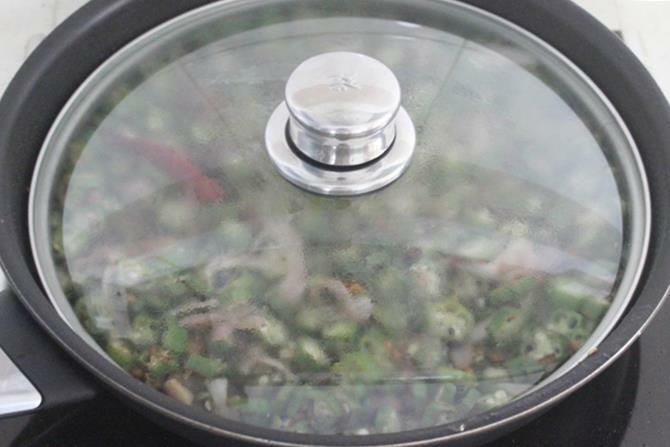 Sprinkle salt, red chili powder, turmeric, coriander powder (if using) , coconut and peanuts as well. 9. Lastly fry till the coconut becomes aromatic takes around 3 minutes. Serve bendakaya fry with rice, phulka or roti. Kindly forward the receipe to make protein powder. I will try to share the recipe. I do not have it on the blog yet. I’m a huge peanut fan and I am looking forward to trying out this recipe ! Thank you! Do try , you will love it. I do stir fries with peanuts only with brinjal, with ladies finger sounds quite interesting. 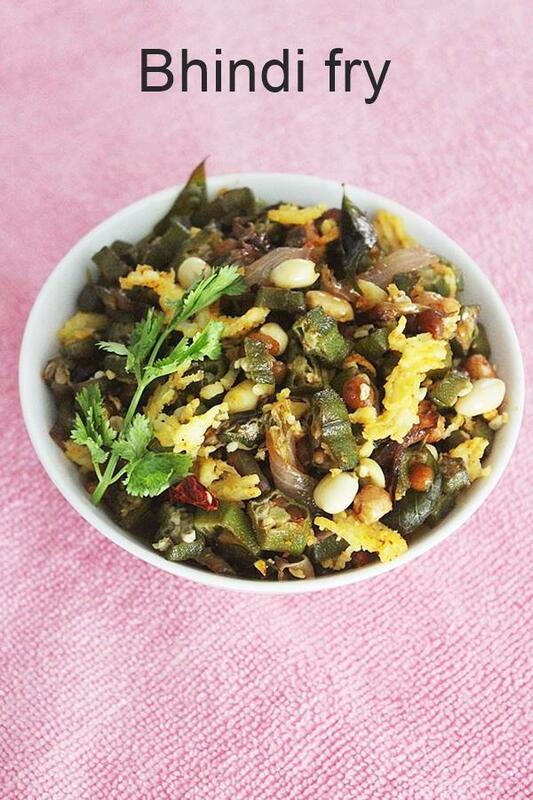 easy and healthy vepudu.. looks delicious!! Yummy and delicious stir fry…….. Love to eat with roti! !